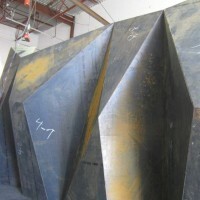 Landscape architect Paul Sangha has created METAMORPHOUS, a corten steel sculpture designed to provide a solution to foreshore erosion for a waterfront property in Vancouver, Canada. 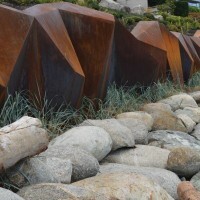 This project began with the King Tides, which struck the B.C. Coastline on December 2012. 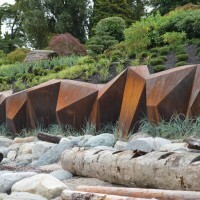 Paul Sangha Landscape Architecture was approached by a couple to provide a solution to their Vancouver property where the King Tides had carved out the entire bank, leaving the deck completely suspended. 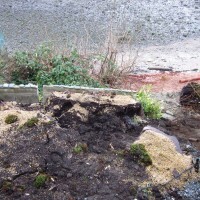 Previous foreshore experience had already proved that constructing oceanfront concrete walls resulted in foreshore erosion. 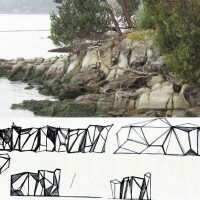 Instead of opting for this common choice, Sangha and his firm took this as an opportunity to create something unique and unlike any other waterfront property in Vancouver. 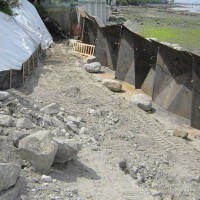 The firm worked with oceanic engineers – Balance Environmental, to develop a solution that would not only enhance the foreshore but also deal with the retention of the bank. 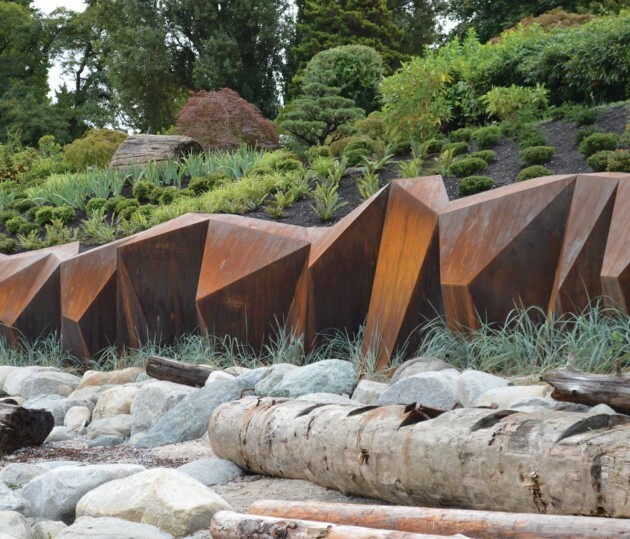 Using corten steel Sangha drew inspiration from the abstraction of sandstone formations seen on Saturna Island here in British Columbia. 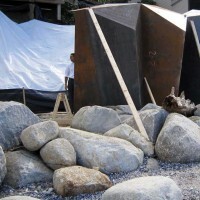 This also became the formwork on to which concrete was shotcrete, and as a result, the corten wall became an artwork that was at the same time functional. 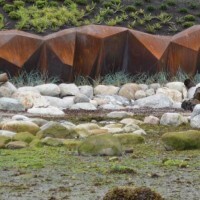 The abstracted shape of the corten, in conjunction with strategic boulder placement along the foreshore played an integral role in dissipating wave energy and ultimately, facilitating the deposition of sand to enhance foreshore and create habitat for flora and fauna. 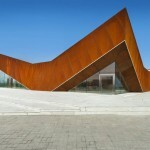 Sangha worked with Fossil Project Services for installation and Drabeck Technologies for the fabrication of the corten steel. 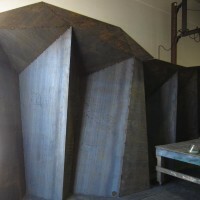 Both physical and computer models were developed, with the computer model being fed into an automated water jet cutter in order to minimize material wastage. 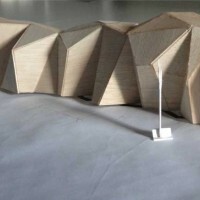 This process helped to simplify the complex forms. 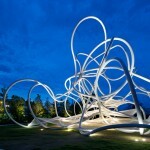 The resulting efficiencies made costs equivalent to what would have been the cost of a series of concrete walls. 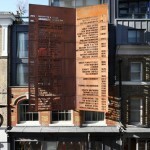 The corten wall initially began as an one hundred twenty foot intervention, but as Sangha was experiencing the same erosion issues with the neighboring clients, they also agreed to participate in the construction of the wall. 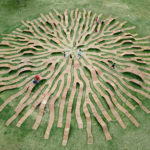 As a result, the wall now spans two hundred feet, transforming from abstracted rock forms from the west to barnacle-inspired formations toward the east. 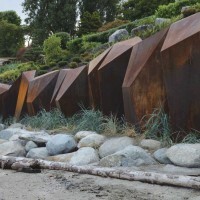 Since its completion, the corten wall has fostered a huge amount of public engagement on the beach, attracting kayakers, sunbathers, beachcombers and local residents. Dune grasses are beginning to establish and sand is slowly depositing. 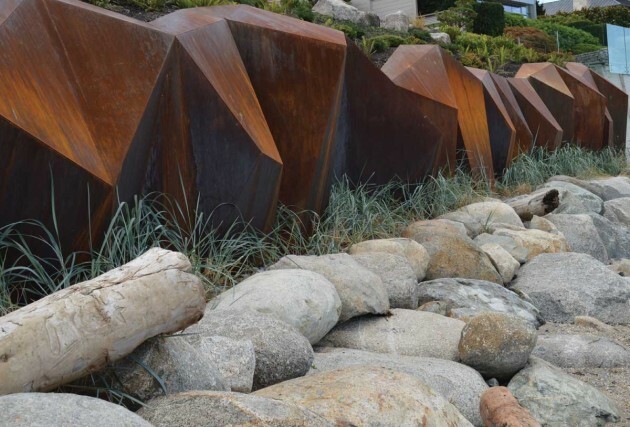 The development and execution of the wall illustrates the first of such an endeavor along Vancouver’s waterfront. 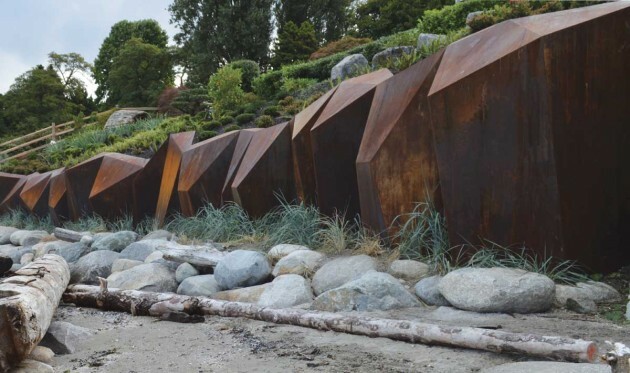 The wall shines as an example of both functional and accessible art that is helping sculpt an identity for Vancouver’s shorelines.